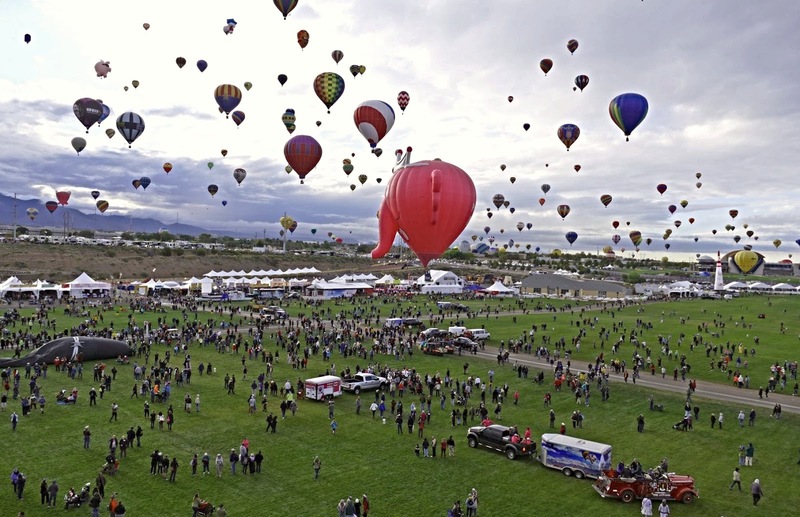 The Balloon Fiesta from the eyes of an Albuquerque local. I received free admission to the Balloon Fiesta in exchange for being on the media team. I have been a resident of Albuquerque for 22 years and love living here. The weather is almost sunny every day and the culture here is the best. I think the best part of living in Albuquerque is the hot air balloons. I never get tired of seeing those colorful hot air balloons floating in the sky. I think the best time of the year in Albuquerque is the month of October as the weather is perfect in my opinion. It is still warm enough to wear shorts but not so hot that you are complaining of the heat. 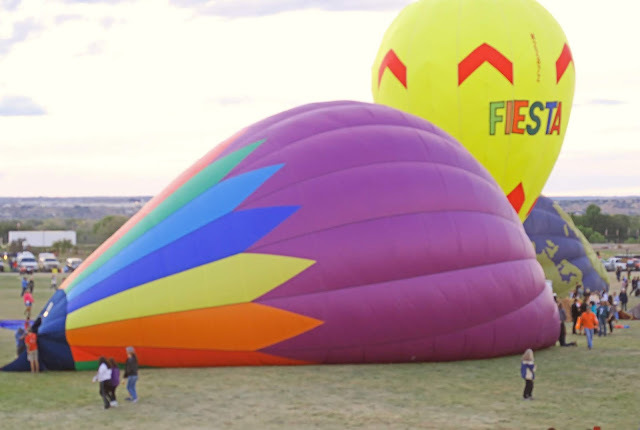 Green chile season happens around this time so the eating is good and the sky is filled with plenty of hot air balloons. The sky is simply picture perfect. 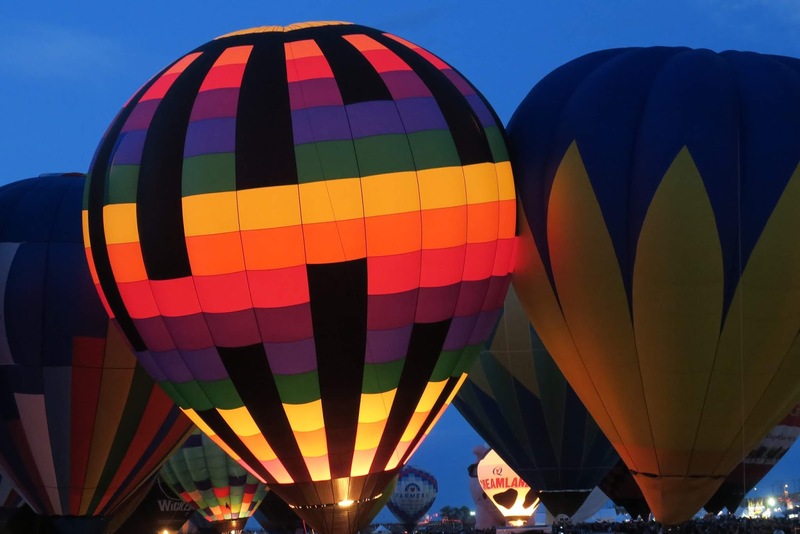 For nine days in October, the Albuquerque International Balloon Fiesta® creates an enchanted world of special shape balloon rodeos, twilight balloon glows, and vibrant balloon-filled skies. 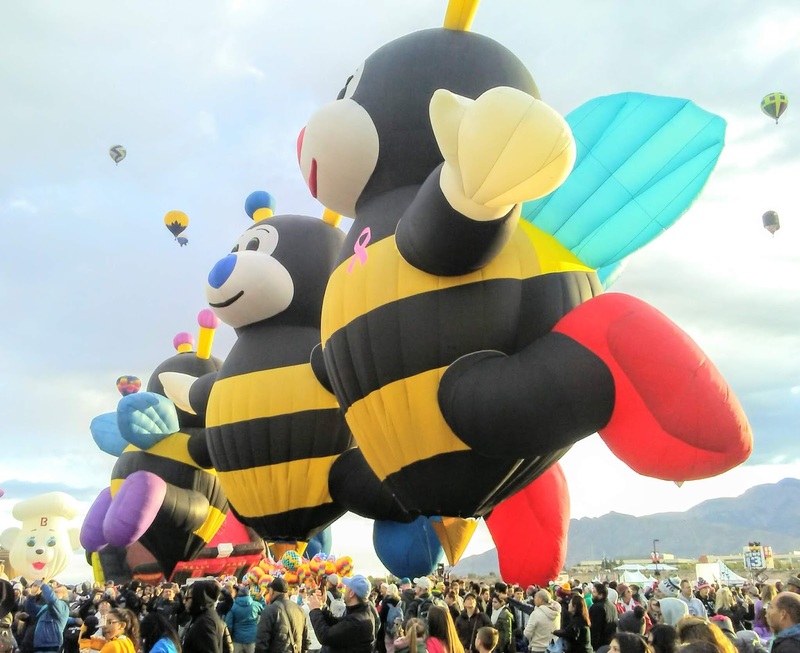 Brisk autumnal mornings in the Rio Grande Valley create an otherworldly backdrop for the breathtaking majesty of our most popular event, Mass Ascension of the Albuquerque International Balloon Fiesta®. In October the greatest event happens. It is an event that leaves most speechless and wishing that they could live in Albuquerque. I am one of the lucky ones as I get to live in a city that hosts the Albuquerque International Balloon Fiesta. Every year I get so excited to attend this wonderful event that has over 600 hot air balloons floating in the sky. One would think that a local would grow tired of seeing the hot air balloons but that is not so. I still find the balloons so magical and love all that the Balloon Fiesta brings with it. I don't mind all the tourists and all the traffic. I don't mind the early mornings of having to wake up at 4 AM or the late nights after the balloon glows. In fact, I get excited to meet new people from all over the world. One year I had the privilege to talk with balloon pilots from the Netherlands. 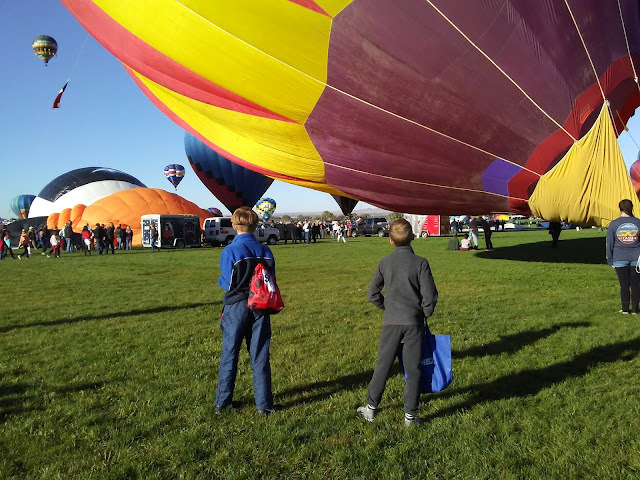 Over the years I have learned some things that make attending the Albuquerque Balloon Fiesta less stressful and you need to check out my Insider Tips For Attending The Balloon Fiesta if you are planning to attend in October. Now is the time to make the hotel reservations as the hotels fill up fast. The biggest balloon at this year's Fiesta(2017) also happens to be the biggest hot air balloon in the world. "It’s 44 meters (144 feet) wide. It's 30 meters (98 feet) high," balloon pilot Herman Kliensmit said." Every year at the Balloon Fiesta, I get some amazing photos. I have even made one into a canvas picture.,that I hung in my bathroom so I can remember the amazing time that I had at the Balloon Fiesta. I have been attending the Balloon Fiesta as media for four years and I have noticed that each year my picture taking skills improve. Last year in 2018, I had an opportunity to borrow a Canon camera while I attended the Albuquerque Balloon Fiesta and I was able to take some amazing photos of the hot air balloons. Anyone who attends can borrow a Canon camera to use while watching the balloons and Canon has a wide variety of cameras to select from. The one I borrowed was $1000 and I was so impressed with the camera. I even had an opportunity to talk with a Canon representative while I was at the Balloon Fiesta as I wanted to up my photos for my website and buy a camera. The Canon people helped me select the best camera for my needs and suggested one that was much more affordable than the $1000 one I borrowed and I even got a discount if I bought it at the Balloon Festival. Now that my boys are getting older, they are ready to bike to the Albuquerque Balloon Fiesta and this is a great way to avoid the traffic. If you choose to bike to the Balloon Fiesta, the event offers free bike parking in a secure place that has volunteers who watch the bikes. Biking to the event is a great way to save money on parking. Did you know that you can also volunteer at the Balloon Fiesta in exchange for free admission? The Balloon Fiesta is a nine-day event in October and has both morning and evening activities. My family attends the hot air balloon Mass Ascension in the morning and the Balloon Glow in the evening. While the Mass Ascension is the most spectacular display of sound and color in all of aviation as the hot air balloons fill the sky, the Balloon Glow the sight of balloons lit from within at night like giant holiday ornaments. The hot air balloons stay tethered on the ground during the Balloon Glow and the pilots fire their burners and light up the balloons in the dark of the night. This is perhaps the most spectacular single moment in all of Balloon Fiesta. 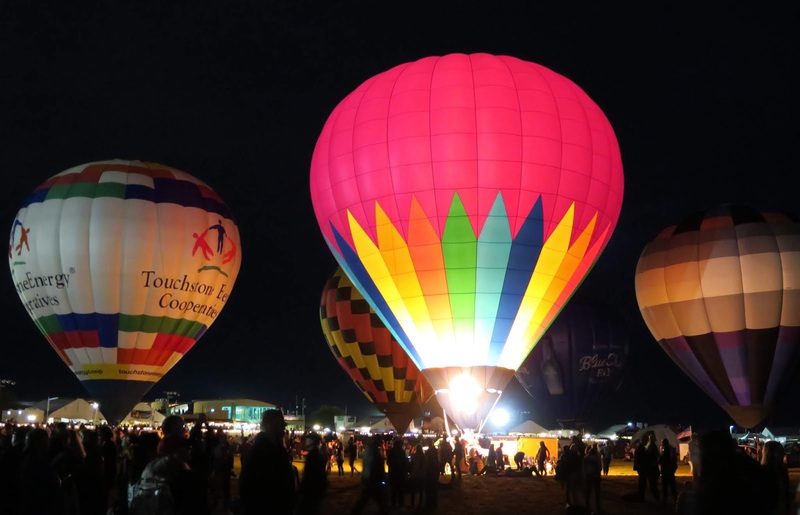 The Balloon Glows are always followed by New Mexico's most spectacular fireworks displays. The hot air balloons are the star of the show but after the balloons go up, my boys and I love to walk Vendors Row and visit all the fun booths. These booths sell food and merchandise. I highly recommend a breakfast burrito with green chile and a cup of New Mexico Pinon coffee as these are my favorite hot air balloon viewing foods. There are also booths that giveaway promotional items or have fun games to play to win free food. The best booth is the Bimbo Bakeries booth is always a favorite as they giveaway tasty snack cakes. Bimbo also has a cool balloon. 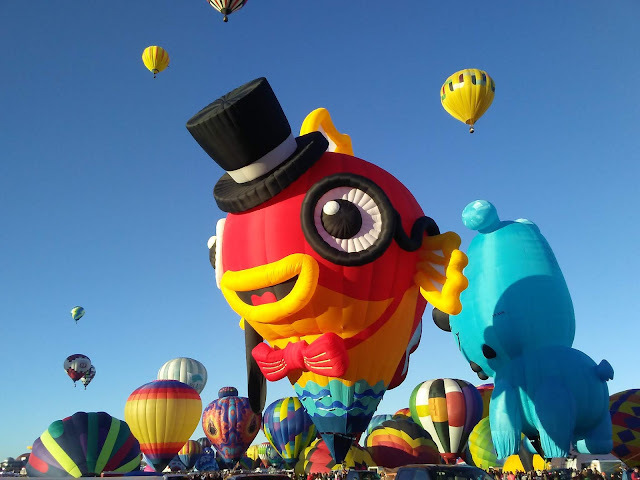 So now you can see why the Albuquerque Balloon Fiesta will leave you speechless as it is an amazing must-see event that should be on everyone's bucket list. If you are looking for a place to travel to this year or the next, then Albuquerque in October is an amazing place to visit. I have always wanted to try being in a hot air balloon thoight I saw one crush and scarred me for a while, its still a dream of mine. I go back and forth about a balloon ride but have not gone up in one yet as I am scared of heights. OMG I'm so jealous,these pictures are so amazing. I've always wanted attend one of these events and ride in a hot air balloon. I think they have one coming up in a few months, I'm gonna look into buying tickets. My husband is terrified of riding in a hot sir balloon so if I ever decided to ride it would have to be alone. Man! I wish I could have seen that in person! All of those hot air balloons looking as though they are lifting at once! This looks like such a great event! I bet my kids would love it! Wow. This is awesome! I have always wanted to experience something like this. What a stunning sight! Wow I love balls and this party left me open-mouthed. It is immense, colorful and lively! I love it! Oh my gosh! I love hot air balloon riding although it's been quite long since I had another. Your experience sounds so great! A hot air balloon trip has always been a dream of mine! It must be so amazing seeing them all take off and seeing the ground from so high! 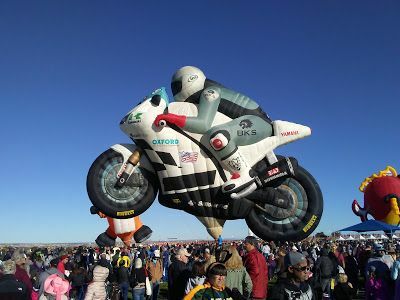 The balloon fiesta seems like so much fun! Very creative balloons. Love the colors and the shapes. This is so awesome. My kids will definitely love this. Its my dream to attend such festival! I think its very beautiful and once in a lifetime event to attend. So beautiful pictures. This looks awesome! I would love to experience this. We have an event here in the Philippines but it's so dusty and hot there in that city. I want to experience this where there is grass. I've been to a balloon fiesta and it is indeed fun to attend to one and watch those giant inflatable balloons fly.